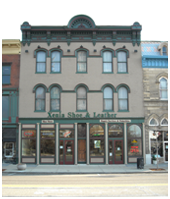 Our beautifully restored building in historic downtown Xenia includes a large shoe showroom. of course, we have shoes in extra wide. We also carry special needs shoes, including diabetic or arthritic needs. We also have shoes that can accommodate braces or lifts and be modified or customized. We can customize shoes and orthotics right here in our facility. We encourage you to come to our store and meet our friendly professional staff. They will take the time to fit you properly and be sure your feet are happy. We are equally glad to work with out-of-town guests, and encourage you to phone or e-mail us with any questions, musings, or orders. Xenia Shoe and Leather is pleased to carry a variety of footwear to fit your needs. More than two centuries of creating comfortable footwear with health benefits has made Birkenstock shoes a popular choice. 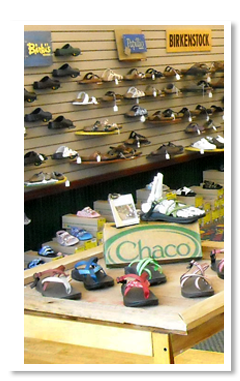 Birki clogs, Birkenstock shoes, Papilio Fashions are all here offering the highest level of foot comfort. Designed to elevate the running experience, Brooks' advanced stability, cushioning and motion control is recognized as the product of choice among runners. Stylishly comfortable clogs, shoes and boots. Comfort for all day wear. Minnetonka Moccasin has been designing and manufacturing top quality moccasins for over a half a century. Inside every shoe beats the heart of a genuine Red Wing work boot. Unparalleled all-day comfort. The first company to use advanced athletic technologies in casual shoes to achieve lightweight comfort, and the first company to engineer walking comfort in dress and casual shoes. Shoes that take people to the edge of possible -- mountaineering, backpacking, hiking, running and multi-sport. The only footwear to offer the exhilarating joy of going barefoot with the protection and sure-footed grip of a Vibram® sole.